"...Except for trucking diesel through enemy territory in Afghanistan, delivering fuel to an airborne F/A-18 with another F/A-18 is the highest “fully burdened cost of fuel” of any service, anywhere in the world. Not to disagree with the thrust of the argument, but the fully burdened cost of fuel study is being misrepresented. Per DESC, Commercial delivery of fuel at a base in Afghanistan cost around $4 per gallon. Now, the scenario in question that cost over $400 per gallon was also in Afghanistan but had nothing to do with fuel convoys or trucks. It was for a SPECOPS raid that used helos to fly fuel (and security forces) to establish a refueling point, which then was used to establish still another refueling point close to the target, and the fully burdened cost of fuel was for the special operations forces to fly to and from the target refueling three times (twice on the way in, once on the way back). So not exactly common. Having said that, using a F18 to refuel another F18 is pretty inefficient, but so is refueling a F18 with a S-3, a KA-6, a A-7, or any other jet that currently fits on a carrier. "On the tarmac of St. Louis’ historic Lambert Field, the future of aircraft carrier aviation may be taking shape. Phantom Works, Boeing’s shadowy advanced prototyping group, has painted part of the tarmac to resemble the flight deck of a carrier. Over the past few months, the company been using this space at all hours of the day and night to test its latest military UAV: a prototype for the U.S. Navy’s MQ-25 “Stingray” program. ...In an exclusive interview with Aviation Week, Boeing Phantom Works MQ-25 program director Don “BD” Gaddis revealed that the T-1 prototype now being tested at Boeing’s military aircraft plant in St. Louis was actually rolled out in November 2014 but was kept hidden from public view until now. The strange-looking creature first broke cover in December 2017, when Boeing released an obscure, front-on image via Twitter. Having started outdoor trials, the company knew it was only a matter of time before images started leaking online. Sure enough, in early January, The War Zone published eight fuzzy images taken by Jeremy McGough as he was flying out of St. Louis Lambert International Airport. Those are the only public images so far that show the aircraft in its entirety, including the full span of its gliderlike wings. ...Boeing is so determined to win this program, it has backed two sides. Boeing Autonomous Systems, a newly created business unit responsible for most of the company’s unmanned programs, is aligned with GA-ASI for the competition and has been internally “firewalled” from the Phantom Works program. “I don’t know anything about what they’re doing because of the firewall,” Gaddis says of the dual teaming arrangement. Last edited by spazsinbad on 08 Mar 2018, 14:21, edited 1 time in total. Whaddya Rekon the 'camera' in the nose if for RECOGNITION of the Director HAND SIGNALS? But I DUNNO. ...Boeing found that its UCLASS design was already a good fit for the tanking mission. Unlike Northrop, which invested heavily in a stealthy, flying-wing design aimed at a precision-strike mission, Boeing opted for a wing-body-tail air vehicle with limited low-observable features and a large payload bay. Externally, Boeing’s MQ-25 prototype, also known as T1, is still the same as its UCLASS design. However, the company had to do significant rework on the mission systems side as the requirement shifted from surveillance to refueling. 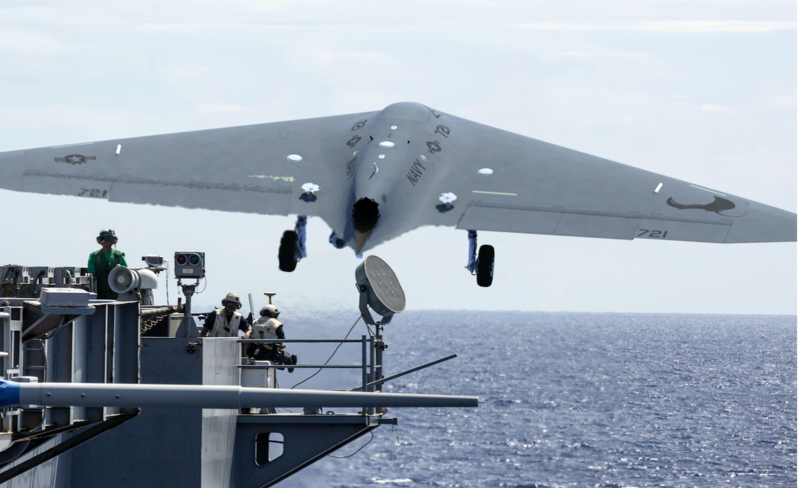 ...Boeing should be ready for the first flight of its MQ-25 shortly after the Navy makes its downselect decision in August, but it still has a lot of work to do before then, Gaddis said. Besides moving its prototype through the standard testing process that all aircraft go through before first flight, it also needs to finish its statement of work. Boeing — like the other competitors — was awarded a contract to refine its MQ-25 concept, which includes activities such as software integration and improving its open-systems architecture. It also includes providing data about how to handle the drone aboard the deck of an aircraft carrier, which Boeing is demonstrating through a series of drills in St. Louis, Missouri. The company mapped out the deck of an aircraft carrier on the tarmac at Lambert Field, and Boeing employees have practiced how to safely and efficiently move its MQ-25 around the ship by taxiing it around, tested the arresting gear and hooking it into a catapult." 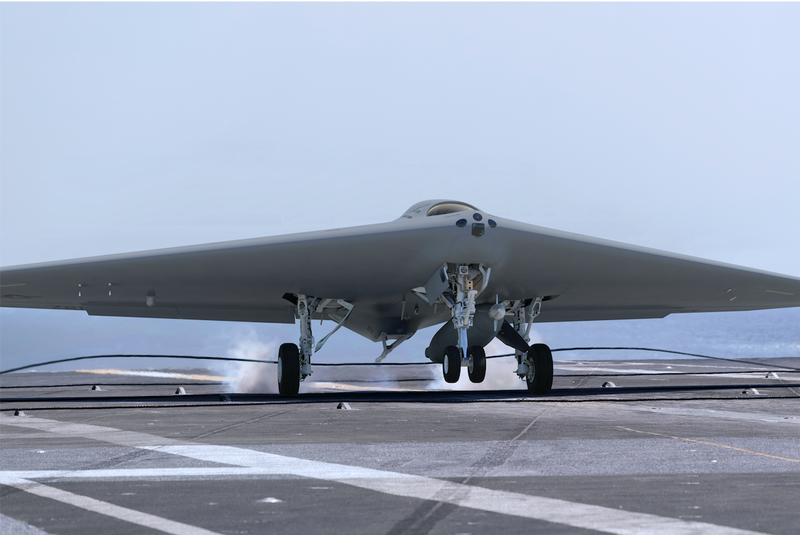 "Lockheed Martin unveiled its concept for the Navy’s MQ-25A Stingray unmanned aerial tanker in a series of images provided to USNI News on Monday by the company. Skunk Works’ answer to the service’s requirement for a new carrier-based tanker is a tailless flying wing design that sets it apart from the other competitors in the program. ...The Navy set aside $719 million for Stingray in the Fiscal Year 2019 budget and plans on buying the first four in 2023 and for the aircraft to achieve initial operational capability on carrier decks in 2026." Graphic: "Lockheed Martin MQ-25A Concept. Lockheed Martin Image"
Lockheed Martin was wise to include the landing gear from the F-35C. Wonder if any other components from the F-35C are used in the design??? Also, wonder what engine they plan to use??? Giving the program a name like 'Stingray' implied a flying wing preference. madrat wrote: Giving the program a name like 'Stingray' implied a flying wing preference. Jeepers that is taking a 'long line' - much like the refueling hose when deployed adds to the STINGRAY image. Boeing is going to win this one as it is a higher volume design. Who says it's a higher volume? I think you forget how much fuel a flying wing holds. Both LM and Boeing will design it to a certain spec and that spec will stipulate a certain volume of fuel. SpudmanWP wrote: Who says it's a higher volume? I think you forget how much fuel a flying wing holds. For that matter, don't discount GA. All three designs are quoted by their companies as meeting and/or exceeding the specification which is pretty extreme (15klbs at 500-550NM). Given that all seem to use either F-18E or F-35C landing gear, they are all in the 70klbs+ all up weight range and since they have to be under 50klbs to recover, that is a lot of fuel. I agree you can't tell how much internal fuel any of them can carry based on appearance! I'd rather Boeing with the MQ-25 and Lockheed win the T-X. Right now the USA could do with some solidifying of relations with Korea. If I had to choose which program I would want to win, I'd probably pick T-X since it seems like a better business opportunity. ...The chosen MQ-25 must have provisions to receive fuel from other aircraft. [wait -wut?!] It will come equipped with a sensor ball for “light ISR” (intelligence, surveillance and reconnaissance) and have size, weight, power and cooling margin to carry a maritime surveillance radar.